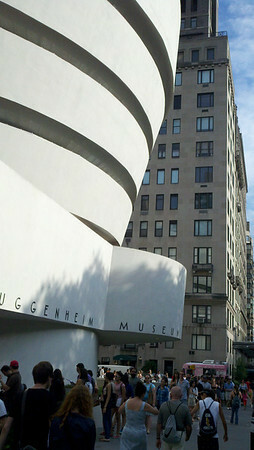 July 2, 20011 / New York, NY -- After a 'What do you want to do today' discussion, Joe and I decided to check out the Guggenheim Museum on the upper east side. We took the subway to 86th St, walked across the park and there we were. It's located on 5th Avenue and is quite a site to see. The building, designed by Frank Lloyd Wright is an icon and my main motivation for going. The museum focuses on a single exhibition at a time. The current exhibition is art by Lee Ufan. It was the type of modern art that you have to really stretch your mind to understand. I mean REALLY stretch your mind. But there are a couple of wings in the museum where they have permanent collections by notable artists such as Paul Cézanne, Paul Gauguin, Edouard Manet, Claude Monet, Pablo Picasso, Camille Pissarro, Pierre Auguste Renoir, and Vincent van Gogh. After touring the museum, we walked home. It was quite a long walk, but it was a nice day and it was a treat to see how 5th avenue transitions from upscale residential to upscale retail. The famous 5th Ave shops such as Gucci, FAO Schwartz, Cartier, Tiffany etc. make it quite interesting.